Handmade medallions awarded to runners who participated in the Harpers Ferry Half Marathon, 2017. Runners line up to register for the Harpers Ferry Half Marathon or 5k. A board placed near registration with information on Harpers Ferry and the course. A runner completes the Harpers Ferry Half Marathon, and a little girl hands him one of the handmade medallions. How Does Running Impact Our Health? West Virginia is one of the top four states in the nation where the obesity rate makes up more than 35 percent of the adult population; that’s according to the Centers for Disease Control and Prevention. According to the West Virginia Department of Health and Human Resources, between 2011 and 2015, the obesity rate in both West Virginia adults and high school-aged kids increased by 3 percent. But in Jefferson County there’s a group trying to combat those numbers by hosting events focused on running. Dr. Mark Cucuzzella is a professor of Family Medicine at West Virginia University, a runner, and the force behind the Freedom’s Run Series of Events. Cucuzzella's spring race was held last Saturday. It was a rainy, cold morning, but still hundreds of people came out for the Harpers Ferry Half Marathon, 5k, and Kids Run. Cucuzzella started his running series eight years ago, in part, to help encourage healthy living and exercise in West Virginians. “Physical activity is just good for your brain, good for your body, does good for everything,” Cucuzzella explained. According to the CDC, adults need about 75 minutes of a vigorous aerobic activity per week, like jogging or running, to help maintain a healthy weight. Cucuzzella says what we eat also plays a big part in our health. “Really, if we’re gonna tackle obesity, we’ve gotta look at what people are eating and what we’re feeding folks,” he noted. There’s another theme to Cucuzzella’s races that he hopes will help get people out and moving – and that’s by incorporating the local Civil War history in the courses, and, at the same time, help boost tourism in the state. (left to right) Dubem, Ike, & Uche Akunyli. The Akunyli family is originally from Nigeria but moved to Frederick, Maryland two years ago. Dubem ran in Saturday's Kids Run, and Uche ran in the 5k. Of the 658 registered runners from Saturday's event, 68 percent were from 23 other states and Canada. Some of the racers traveled from far away, but some live closer like Dubem Akunyli who lives in Frederick, Maryland. 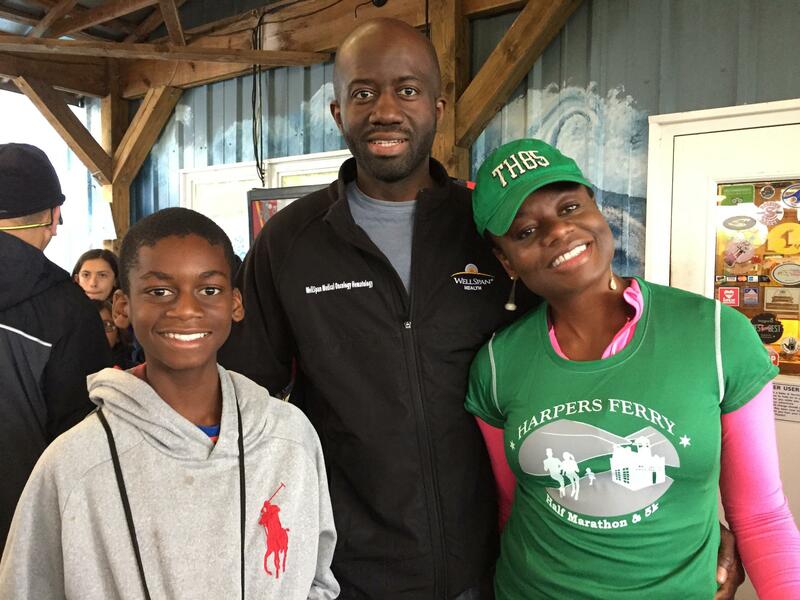 Akunyli ran in the Kids Run, which is one mile, and he says he loves visiting Harpers Ferry. “It’s really cool, and it’s really cool about knowing about John Brown and his raid, so it’s very interesting here, and it’s really nice, like with the trees, and all of the mountains,” Akunyli said. Cucuzzella says a big part of his spring race is that any child under 17-years-old can run for free. The local community also plays a large role in Cuccuzzella's races. Restaurants, coffee shops, and others come out on race day to provide food and drinks. Local groups volunteer their time to cheer on the racers and help with registration. Even the medallions awarded to the runners who participated in the Harpers Ferry Half Marathon and the Freedom's Run in the fall are made locally. That local potter is Joy Bridy. She lives in Shenandoah Junction, which is a few miles from Shepherdstown. 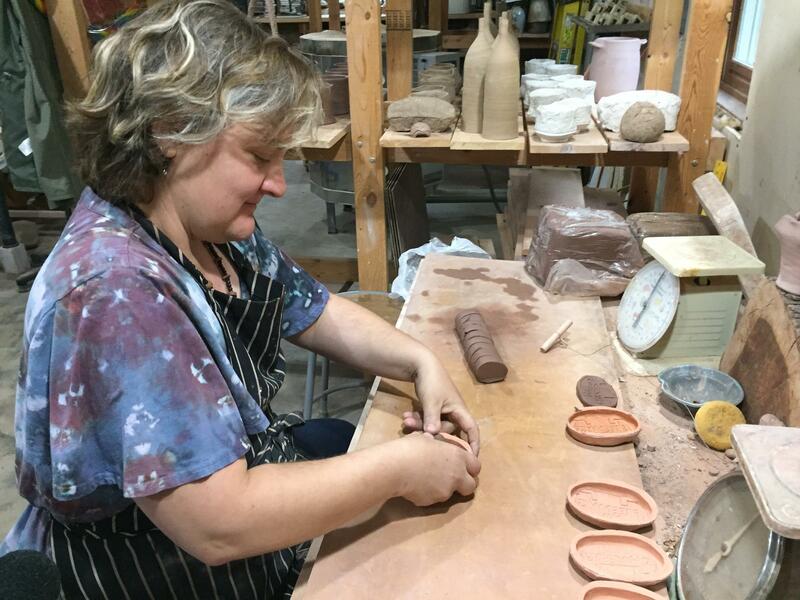 Local potter Joy Bridy presses wet clay into a mold that says, "Freedom's Run." She also made the 500 medallions for the "Harpers Ferry Half Marathon." Bridy says it’s an honor to be part of the races, and she hopes by awarding handmade medals, it adds a little something extra. Bridy made 500 medallions for the Harpers Ferry Half Marathon. She will make 1500 for the Freedom's Run. Bridy makes each medallion by hand and says making them is her "own marathon." Even though only a third of Saturday’s racers were West Virginia residents, Dr. Mark Cucuzzella hopes as his race series enters its ninth year, it will spark even more community involvement and continue to promote health in the state. The 26.2 mile Freedom's Run will be held on September 30, 2017. West Virginia veterans earned over 30 medals last week at the national Golden Age Games. The competition is an athletic training program for veterans 55 years old or older and is designed to help veterans lose weight and become more physically fit. About 800 veterans competed in the Golden Age Games competition in Biloxi, Mississippi May 7-11. Veterans from the Martinsburg VA Medical Center won medals in running, swimming, badminton, shot put and bicycling. Judi Roberts, from Martinsburg won first place in the discus competition. Veterans who receive care from the Clarksburg VA medical center lead the nation in a program that prevents drug overdose deaths. The program distributes Naloxone rescue kits to veterans who are at risk of overdose. Many of the kits have been used by veterans to save civilians who may have otherwise overdosed from opioids. Veterans returning from combat often struggle with chronic pain and/or mental illness, and many are taking multiple medications. When combined… or when alcohol or non-prescribed drugs are also taken, these drugs can lead to a deadly overdose.